Last weekend snow descended on the UK. After one of the mildest winters on record, including un unseasonally warm Christmas Day, we’re finally being reminded what it feels like to be cold. As is always the case in a country where we’re as unprepared for annual snowfall as we are surprised by the heatwaves that regularly occur in the summer, lots of things ground to a halt; thousands of flights were canceled, trains came out of service, motorways slowed to a standstill. While snow always brings a certain element of chaos, it also adds a sense of peace and tranquility. The world is a different place under its blanket of snow; smells are crisper, scenes softer and sounds swallowed by the heavy sky and thickly carpeted ground. In London the snow never lasts very long – delicate flakes of ice are little match for the combination of traffic, heat and hundreds of thousands of feet pounding the pavements – but for a few hours at least, the road outside our flat stayed covered in a pure, snowy blanket. While the outside world was smothered in cool, clean white, the world wide web has been taken over by an altogether different colour over the last couple of weeks; pink. Pink and red to be precise. Everywhere I look, the internet is plastered with these products; red roses, coloured cards and chocolates, pink champagne, personalised Love Hearts and hundreds and hundreds of Red Velvet recipes. With Valentine’s Day just around the corner, the urge to think pink has proved irresistible for brands and bloggers alike and, as is often the case at this time of year, it’s all becoming a little bit too much. I’m as guilty as the next person. Last week I posted this recipe for rhubarb and blood orange ice cream hearts; pale pink treats which shamelessly reflected the consumer messaging of Valentine’s Day in both colour and shape. I’m not saying there’s anything wrong with a little romantic indulgence, but right now I think I’ve reached saturation point with all things pretty and pink. I may change my mind come 14th February with the lure of a dozen red roses delivered to the door, but for the moment I want something simpler on my plate. No food dye or dramatic colour, just a good, honest pud, full of all my favourite flavours. 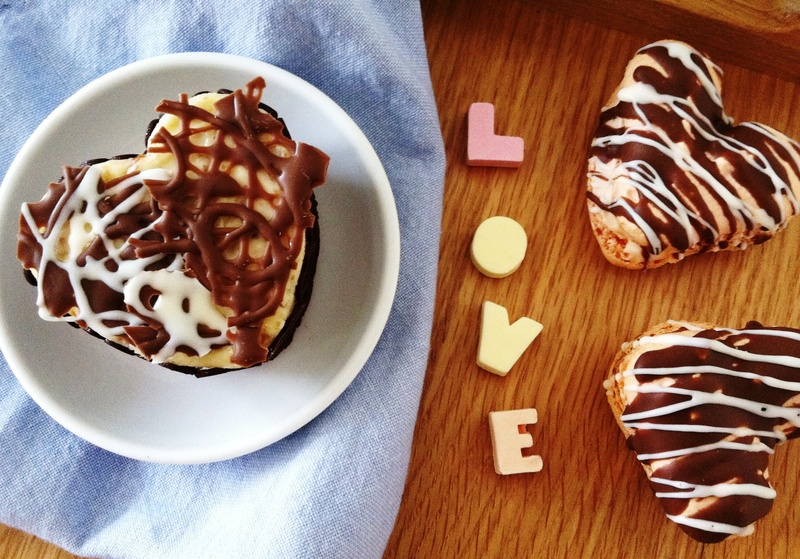 A couple of weeks ago I applied to take part in a Valentine’s Blogger competition held by Baking Mad. A little like a baking version of Ready, Steady, Cook (minus the studio audience and snazzy vegetable-themed aprons), the competition saw fifteen of us get sent a box of Silver Spoon Cake Craft products through the post. Presented with everything from flavoured icing sugar to chocolate cake covering, fudge pieces, fruit pastilles, rose water and more, we were given the task of coming up with a delicious dessert that we would like to receive on Valentine’s Day. I was initially drawn to the flavoured icing sugar, mostly because it wasn’t something I’d seen before. I take part in a monthly macaron making challenge with Mactweets and, thinking it could be an easy way to incorporate new flavours into these treats, set about making a batch of heart-shaped strawberry shells. The icing sugar produced lovely pale pink meringues with a strong fruity flavour. I sandwiched these together with a white chocolate cream before drizzling in dark chocolate (both made with products from the box) to make heart-shaped strawberries and cream macarons. They were good, but being completely honest, to win my heart on Valentine’s Day there has to be a lot more chocolate (and a little less pink) involved. The second recipe I made – and the one featured in this post – was inspired by the wintry weather. Having realised that brownies were a better bet than macarons to provide the perfect chocolate fix, I added a layer of creamy cheesecake batter to take them from decent snack to decadent dessert. Inspired by the pure, clean snow lying undisturbed across our garden, the cream cheese is stirred through with chopped toasted hazelnuts and a dash of frangelico for added indulgence. As the brownie bakes, the layer where batter meets cream cheese becomes densely fudgy and delicious, while the contrast between soft, smooth layers and the slight crunch of toasted nuts is utterly divine. To add a sense of occasion, the edge of this brownie is bordered with tiny chocolate hearts (again courtesy of Silver Spoon) and the whole thing is topped off with shards of chocolate lace, made by melting and drizzling a packet of chocolate cake covering over baking parchment. If you don’t have the time or inclination to temper your own chocolate, it’s an amazing cheat – the melted covering sets hard in a matter of minutes meaning you can pipe the most amazing shapes your imagination can provide before peeling off the paper and decorating your cake. The perfect last bite – do you love anyone enough to share it with them? So here it is, my ultimate Valentine’s Day dessert; the perfect combination of rich chocolate, cool creaminess and toasty crunch with the tiniest hint of booze and a few little hearts thrown in for good measure. But not a hint of pink in sight. I’ve written the recipe below for a 20cm square pan as this is what most people are likely to have to hand. If you want to make the little heart shapes, the same amount of mixture worked in a large 8 cup heart-shaped muffin tray with a little left over (cook’s perks! ), but do use your common sense and judge by eye . . . This will make more topping than you need for this batch of brownies, but it should keep in the fridge for a few days and is just as good eaten on its own. Cut out a large sheet of baking parchment and lay on a flat surface. Melt the chocolate according to instructions on the pack. Cut a very small corner off the packet and pipe patterns over your baking parchment as desired. You can swirl together the white and milk chocolates, or leave separate. Allow to set (this will take a couple of minutes) If you’ve piped one big sheet, break into rough pieces or use a warmed, sharp knife to cut into clean lines. If you’ve piped individual shapes, peel carefully from the baking parchment. Set aside. Cream together the cheese, sugar and egg yolk. Squeeze in a little lemon juice to taste (this cuts through the richness) and add the vanilla extract and Frangelico (if using). Stir through the chopped hazelnuts and set aside. Preheat the oven to 175 degrees C. Grease and line a 20cm square pan. Place the chopped chocolate and butter in a bain marie and melt slowly. Set aside to cool for 10 minutes. Sift together the flour, cocoa, and salt into a medium bowl and set aside. In the bowl of an electric mixer fitted with the whisk attachment, whisk eggs and sugar until light and fluffy. Add the cooled chocolate then the vanilla extract, and continue to whisk until combined. Fold in the flour mixture carefully. Pour the mixture into your prepared tin so that it comes half way up the pan. Take your cheesecake mixture and spoon over the top of your brownie batter, taking care not to disturb the mixture so you have two clearly defined layers. Bake in the centre of the oven for 20 – 25 minutes, until the cheesecake mixture is just set but not completely firm to the touch. As always with brownies, err on the side of caution – if you think your oven may be hotter, check them a little sooner. Remove from the oven and allow to cool completely before slicing into squares. 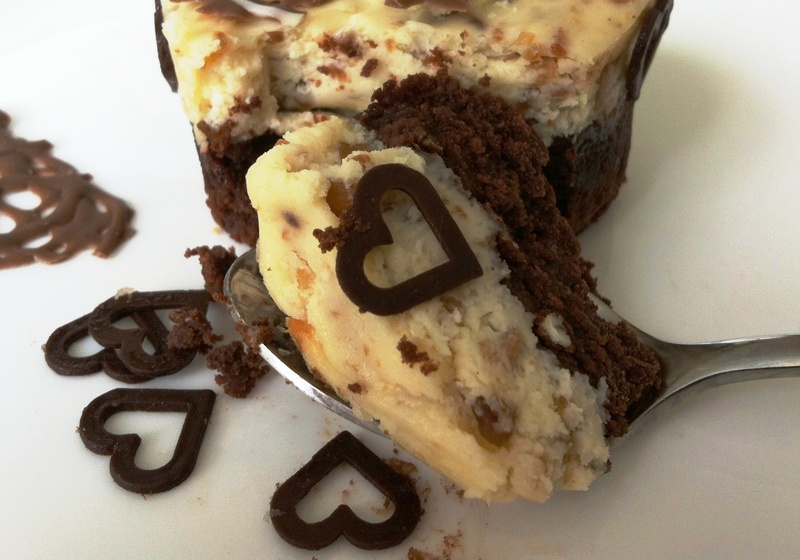 Take a brownie and carefully place chocolate hearts around the edge where the cheesecake and brownie mixtures meet. 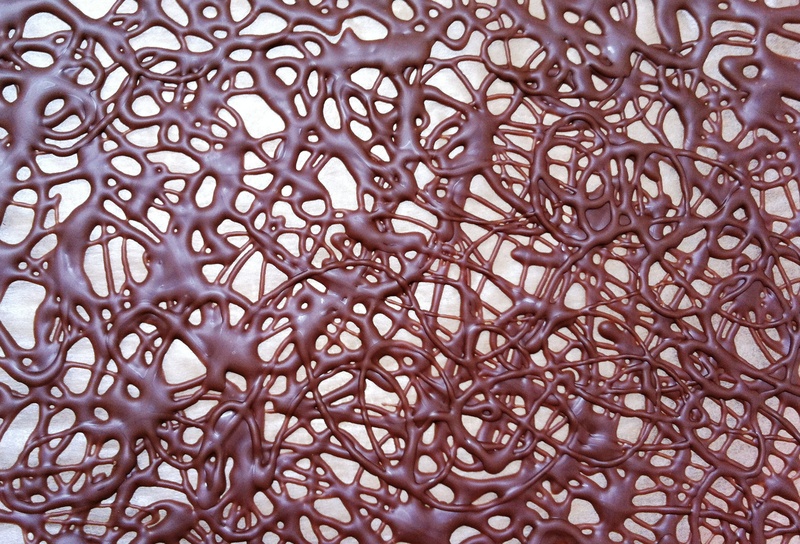 Press shards of chocolate lace carefully into the cream cheese mixture on the top. Serve. I love all things pink. But I love all thing chocolate more. These brownies look absolutely amazing – decadent, chocolatey and creamy. Heaven. And I love the little chocolate hearts too. So sweet. No pun intended. Those look stupid good. I’m sitting here, in the UK, freezing my behind off – it’s just so cold! Cheesecake brownies have always been a favourite of mine. I love the contrast between the 2 flavours and imagine that adding nuts and Frangelico make them EVEN better…..if that’s possible. Beautiful! I want to take a big bite right off my screen! These look fab, can never resist hazelnut and chocolate brownies. Frugal Feeding – thanks. Make a batch…if you eat enough you might manage to put on an extra layer of insulation against the cold! Tom – I would recommend as many gestures as possible to keep her sweet, including a big batch of these! Laura – I’ve not used frangelico much in my cooking but a little touch is so delicious. Arwa – haha, if only that were possible! What a great recipe, and such beautiful beautiful pictures! I for one would certainly not turn away a tall, dark handsome stranger knocking on my door on the 14th with one of these for me…never mind the dozen red roses!! Never have I wanted to reach through the screen and eat something so much. These look incredible. I love the decoration and the use of both frangelico AND hazelnuts. Wow. So impressive! Oh wow this looks so good! Hazelnuts and chocolate are one of my favourite dessert combinations too. You didn’t go pink but you couldn’t resist the hearts…which are adorable by the way. They perfectly dress up this treat. Lorraine – you know what? I actually quite like pink – it’s just this week I’m feeling a bit saturated with it all! Elly – ah, thank you! What a lovely idea! 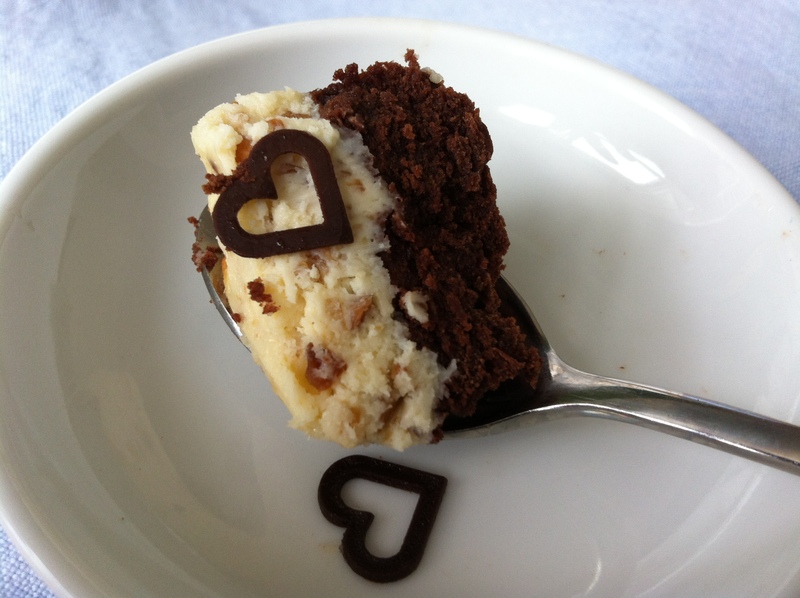 Love your presentation and Hazelnut, cheesecake and brownies… WOW! You have a winner on your hands my friend. I’d be very happy to eat one (or several!) of these on valentines day! They look amazing. that looks really gorgeous! and kudos for not doing it in pink. Yum!! Those brownies look amazing!!! I love those gorgeous hearts. So cute! Absolutely gorgeous. I’m betting they taste amazing too! Oh my God! wow, what brilliant ideas and such inspiration! Lisa – haha, I love the idea of an Oscar ceremony dessert. Shu Han – ooh, definitely too cold to be working outside at the moment. Get back in and get the oven on! Beti – the toasted hazelnuts and frangelico with the chocolate is such a delicious combo. Yum! I love the look of all those chocolate drizzles! What a coincidence! I have just finished making lace chocolate hearts (from a dark Lindt chocolate bar) and I’m just waiting for them to set before sticking them on top of my Chocolate Cupcakes! Happy Valentine’s Day! These are so pretty!! What a scrumptious dessert! Scrummy! 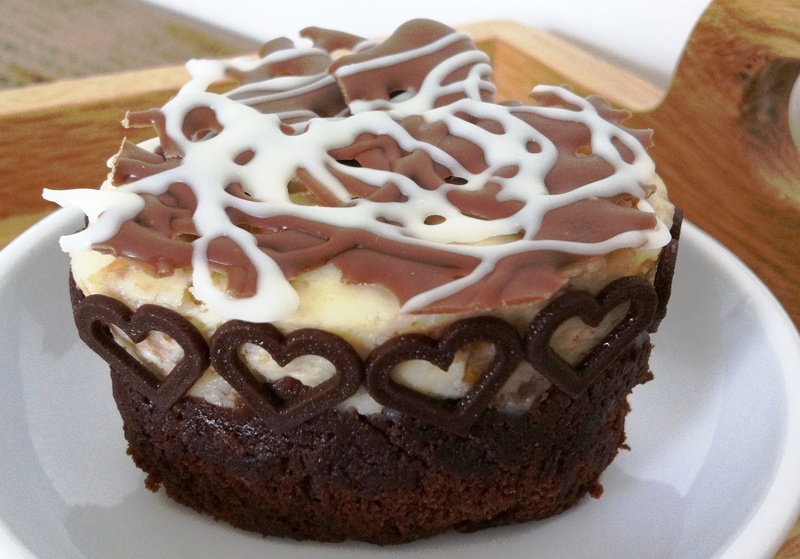 Love the way you put the little chocolate hearts around the cheesecake. Congrats on being a runner up in the competition 🙂 Well deserved. Beautiful. Who wouldn’t be bowled over if presented with one of these? It would win me over certainly, but then brownies probably my all time favourite sweet treat. I also made hazelnut treats on V-day, but in the end didn’t post them. I will do soon though. Just gorgeous. Whats not to love! It’s beautiful and I love the combination! Yum!